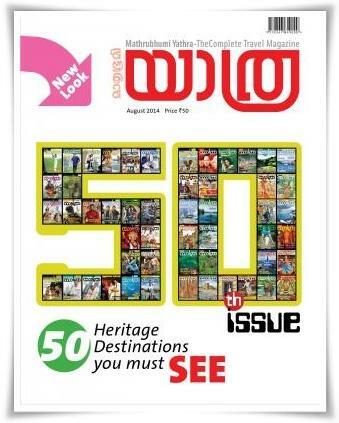 Mathrubhumi Yathra, the most popular travel magazine malayalam has published its August 2014 edition. Specially designed for the people interested in voyages, this issue is highly packed with contents including vibrant journeys, travelogues location details, routes & maps, hotspots and geographical histories of a range of places. The 50th issue focuses on Akalappuzha, Poringal-Orukomban, Speaking Suitcase-Anita Nair, Bheemeshwari, Amberfort, Murud Janjira, Photo Blogue, Travel Trends, Inbox and Travel Tips. Being the final choice of voyagers, 'Yathra' has already become the most popular travel companion. The unparallel natural beauty of Akalappuzha is well described while the readers get an insight into the region. A country boat cruise through Akalappuzha would definitely make the youngsters to have a visit to the place. An article on Bheemeshwari zooms into a wildlife Sanctuary located near Mandya district of Karnataka receives a lot of visitors during various seasons. The river is full and the forest beautiful and lush while September and February is ideal time for bird watchers to spend their time. Another interesting article on Amber situated in Jaipur gives a well description on the Amber Fort which is known for its artistic style of Hindu elements. With its large ramparts, series of gates and cobbled paths, the fort attracts many people. Murud-Janjira sea fort in the Arabian sea is another attraction of this issue. Situated on an island just off the coastal village of Murud, in the Raigad district of Maharashtra is considered one of the strongest marine forts in India. The fort can only be approached by sailboats from Rajapuri jetty. The current issue of 'Yathra' would be a thrilling experience and could be beneficial for masses who are deeply interested to take trips to discover the lush and beauty of the country. Enriched with colourful photographs and travel guidelines, the magazine will serve as your perfect travel companion. A young team of youngsters interested in traveling and writing travel experiences have made the current edition more beautiful. 'Yathra' has shed light to many people proving ample information on various places during the years. The other regular columns like Exciting Packages, Quovadis, Smart Traveller, Travel Trends and Parting Shot will keep the interest on the crest. Experience the real thrills offered by 'Yathra' which is priced at Rs 50. So grab the current edition of the Travel magazine and take a trip to your favourite destination.